Save and organize your favorite recipes with your own food categories. Your favorite recipes are easy to display and print with EZ Home and Office. There's even a search function to find your recipes quickly. Enter your own recipes or cut and paste them from a document or the Internet. You can add up to four pictures to a recipe. Print the recipe and have it right where you need it when you're	preparing food or email a recipe to a friend. Recipes are indented for punch holes. 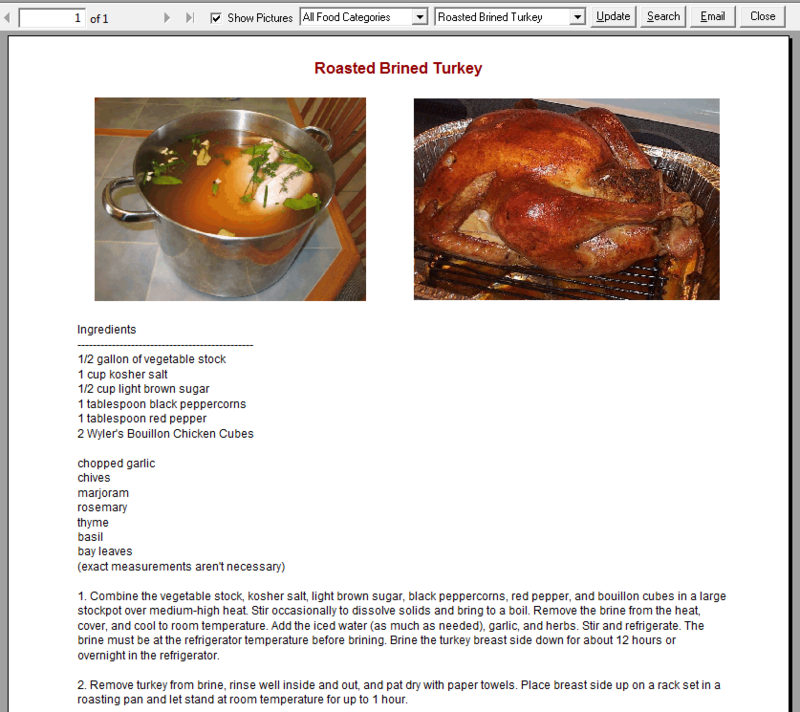 To print on a page size other than 8-1/2 x 11, export your recipes to PDF files. Then in Adobe Reader change the page size to	print on 5 x 8 cards for example. The PDF files can be shared with other computers and smart devices by using Dropbox. With 'Select Features' on the Tools Menu you can remove the Recipe Organizer and other functions to simplify the program. Recipe screen shot and information below. Click on the toolbar or select 'Recipes' from the Features Menu to add and display recipes. Check 'Show Pictures' to display pictures if any were added to the recipe. You can select a food category and recipe from the drop-down lists. Click Update to add, change, and delete food categories and recipes. Click 'Email' to email the recipe. The recipe will be copied to the Windows Clipboard and can be pasted in the email. Click on the toolbar, use Ctrl+P, or select 'Print' from the File Menu to print the recipe.